Tonight, I got my third night of clear skies in a row, which is a rarity in Ohio during the winter. So I spent most of the night observing Saturn, both with and without a #80A filter. I also spent some time on M51, the Owl Nebula, and Comet Lulin. Below is a sketch I made of Saturn tonight. Saturn - March 14, 2009. Sean: hey dont foget the beehive is in this part of the sky,albeit ,further west. Last night I checked out the Beehive and the smaller cluster in cancer,plus Saturn,I was tired to the bone and before I knew it the 4 was "frosted" over lol. What does your sketch of March 14, 2009 signify exactly? 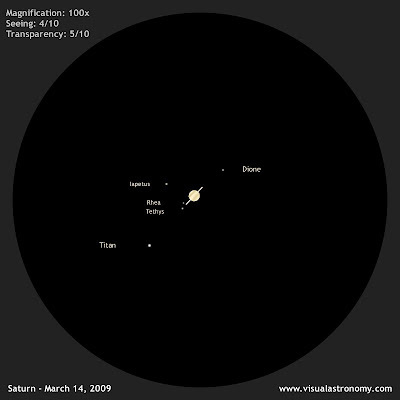 The reason that I ask is I googled Astronomical Phenomena for March 14, 2009 because, very peculiar feeling moments (unrealness) happened, almost an onlgoing mystical feeling when I was walking a trail at dusk with a friend in Portand, Oregon. We both felt it, it was like magic and we can only conclude that something was happening in the universe and maybe dusk is underated?! you can post me what you think if you want or email me at elaineallen8@yahoo.com if you aren't to busy. Thank you for any time that you may have to consider what I have questioned! I would prefer to imply bless you designed for issuing it emails. You want various understanding of designer reveal. Expects your internet-site can assist all of us so you can understand of potential future designer reveal. At present follow-up Cash Advance Bless you for this purpose percentage.